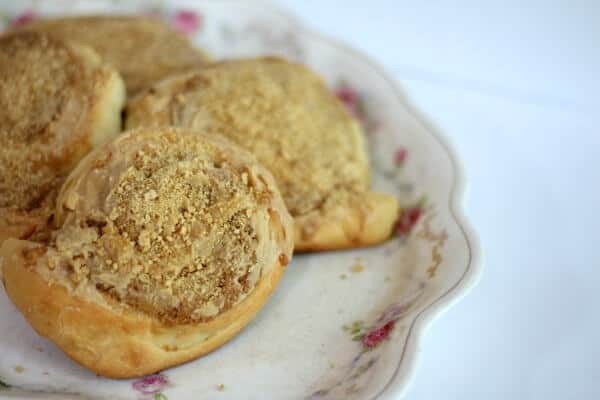 These peanut butter sweet rolls are soft and buttery with a peanut butter cookie swirl, a peanut butter glaze, and a sprinkle of graham cracker crumbs for a pretty finish. This makes enough dough for a double batch or store half of the dough in the refrigerator for up to 3 days. You’ll be able to make rolls whenever you want them. A couple of days ago I was paging through one of my old cookbooks and saw a recipe entitled, Whirlamajigs. It totally stopped me in my tracks… I mean who could resist something called a Whirlamajig? Not me. From what I could tell it was basically peanut butter cookie dough rolled in a sweet biscuit dough. It seemed interesting but I thought it would be more awesome made out of a sweet yeast dough. I have always loved a sweet-salty combination! 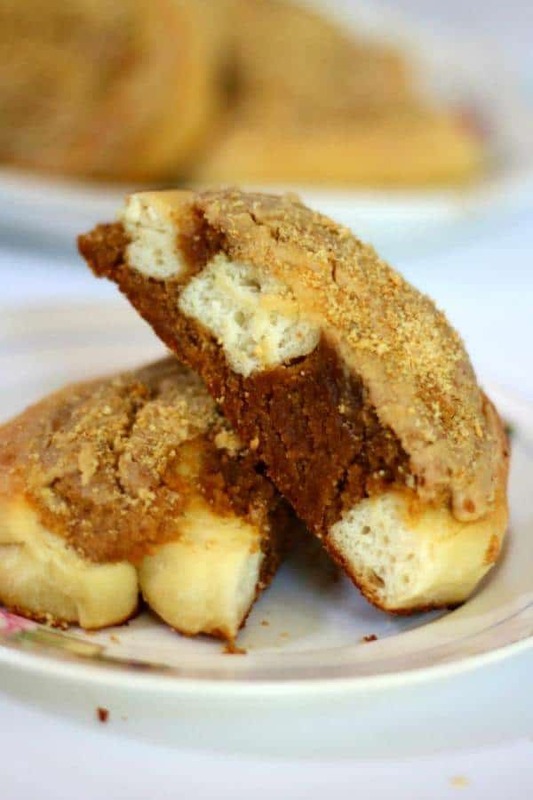 Puffy, chewy, sweet, salty peanut butter sweet rolls? Yes please! I love this dough. It’s an old recipe that was developed to help housewives in the 1930s save time by making a big batch of dough and keeping it in the new fangled refrigerator. They needed to just take out what they needed for a meal. It’s a very rich dough so rising may take a little longer than normal and you may not see the billowy dough you’re used to seeing. As long as it doubles you’re good. The dough makes fabulous dinner rolls and cinnamon rolls. The rolls stay soft and don’t get stale easily thanks to the amount of fat and sugar in the recipe. So, let’s say you make the dough on Sunday, let the rolls rise overnight in the fridge, and bake them Monday morning… you’ll still have dough left for dinner rolls on Tuesday, and maybe even cinnamon rolls on Wednesday. That’s the kind of hardworking recipe I love! The roll part is similar to Hawaiian rolls in sweetness and the peanut butter part bakes up into a chewy peanut butter cookie swirl. I thought about putting a chocolate glaze on it but decided to go with peanut butter to enhance the peanut butter flavor even more. If you love peanut butter you’ve got to try these sweet rolls! The following are affiliate links. When you click through and buy something I get a small commission. It’s used for keeping the blog up and running smoothly. Thank you for being a part of Restless Chipotle! A high quality vanilla is essential to any recipe that calls for vanilla. Nielsen-Massey Vanilla is my favorite. When you take the top off the smell of heady vanilla beans fills the air around you. I use Red Star yeast, and I have for years. I buy big packages of it on Amazon because I use so much in my baking. It’s extremely affordable when you buy it this way and I find that the yeast lasts a long time if you keep it in the fridge. Here’s the Peanut Butter Sweet Rolls recipe! When you make it be sure to upload a picture to your Instagram and tag #RestlessChipotle. I’d love to see it. Soft, sweet rolls filled with a layer of peanut butter cookie with a peanut butter glaze on top. A nice change for cinnamon rolls! Mix the yeast with the warm water. Set aside until the yeast gets bubbly, about 5 minutes. Warm the milk to about 100F. While the milk it warming put the vanilla, sugar, butter, and salt in the bowl of a stand mixer. Pour the hot milk over the top. Beat on 1 until smooth. Add 1 cup of the flour and whisk in. Stir in the yeast and water mixture. Add 3 cups of the flour and beat on medium until smooth. Slowly add 2 to 3 cups of flour to make a soft dough. Knead for about 3 minutes or according to manufacturer's instructions. Turn the dough out on a lightly floured surface. Knead by hand for a minute or so just to ensure that it's ready for the next step. Form dough into a large ball, cover lightly with butter, and place in a large buttered bowl. Let rise until double, about 1 hour. Gently punch dough down, form into a ball, and let rise until doubled -- 45 minutes. Turn out onto a lightly floured surface, divide in half, and store the half that you aren't using in the refrigerator to be used for dinner rolls or cinnamon rolls. Roll the remaining dough out into a large rectangle. Spread with the peanut butter mixture. Cut in 1-inch thick slices and place cut side down on a lightly greased baking sheet. Bake at 375F for 20 to 25 minutes, or until done. Remove from oven and spread with glaze then sprinkle with graham cracker crumbs. Beat the peanut butter and butter until completely blended, scraping down the sides of the bowl often. Beat in the brown sugar and eggs. Use to fill the peanut butter sweet rolls. Melt the butter and peanut butter together in the microwave. Now add enough powdered sugar to make a thick glaze. You may not need all of it. Spread the glaze on the rolls while they are still warm. Sprinkle the tops with graham cracker crumbs. To store unused dough, grease top, place in a greased bow, and cover with plastic wrap. Keep in the refrigerator until ready to use. Shape and let rise for 40 minutes before baking. How many graham crackers are used in the filling? The list of ingredients for the filling is confusing. I think I may prefer crushed peanuts on top. 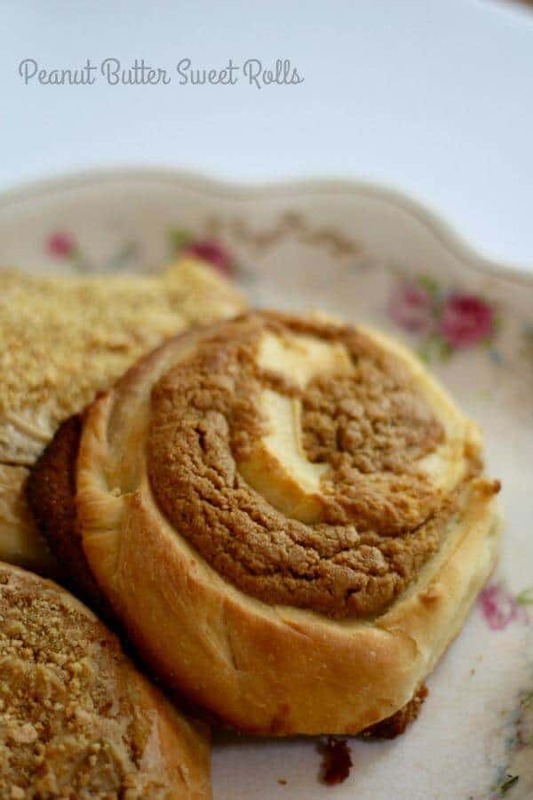 When I was a young girl abakery in our small town made fabulous sweet peanut rolls. Sounds a lot like your recipe. Can hardly wait to try this recipe! We love peanut butter. I would put chocolate and peanut butter glaze on them. These are a peanut butter lovers’ dream come true! 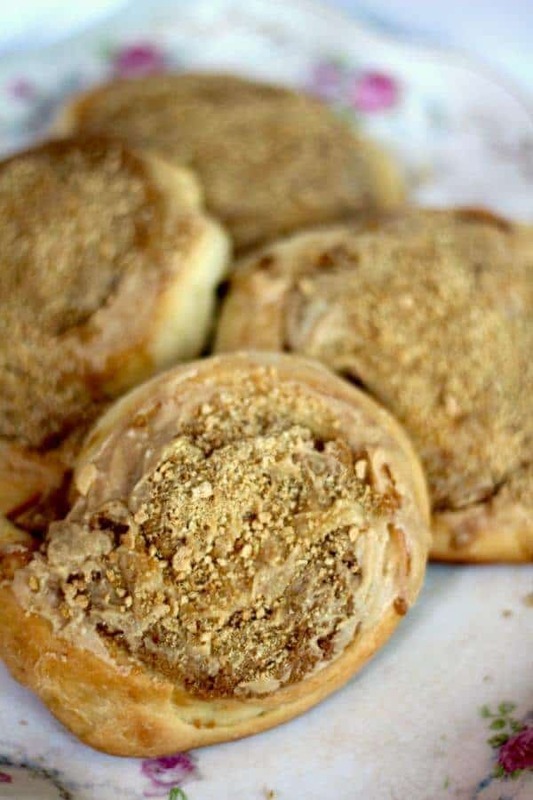 Who wouldn’t want to wake up to these peanut butter sweet rolls?! I am in love with this recipe! Peanut butter…sweet rolls…I’m there! These sound so delicious!